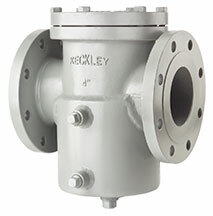 The Keckley Company offers many industrial & commercial pipeline strainer options to include epoxy coatings, galvanizing, oxygen cleaning, special tapings, specialty flange connections & NDE testing. These specialty strainer options are available for Y-strainers, simplex basket strainers, duplex basket strainers, and our fabricated product line. Keckley can offer a variety of specialty epoxy coatings externally or internally for all types of applications including FDA approved. Depending upon the epoxy requirement they are brushed on, sprayed on, or baked on. Keckley can provide any strainer in a hot dipped galvanized option. Keckley can provide oxygen cleaning for smaller size y-strainer and basket strainers, as well as, screens or baskets only. Keckley can provide custom specialty vent, drain, or differential tapings on carbon steel and stainless steel y-strainers, basket strainers, duplex basket strainers, and our entire fabricated product line. Keckley can provide special flange drillings or specialty flanges including Ring Type Joint (RTJ) or PN16 flanges on carbon steel and stainless steel items. Keckley can provide welded steam jackets for carbon steel and stainless steel y-strainers, basket strainers, duplex basket strainers, or fabricated items. Liquid Penetrant Examination (PT) as well as other non destructive examination (NDE) procedures can be performed.